Looking for hotel accommodation near The Customs House in South Shields ? 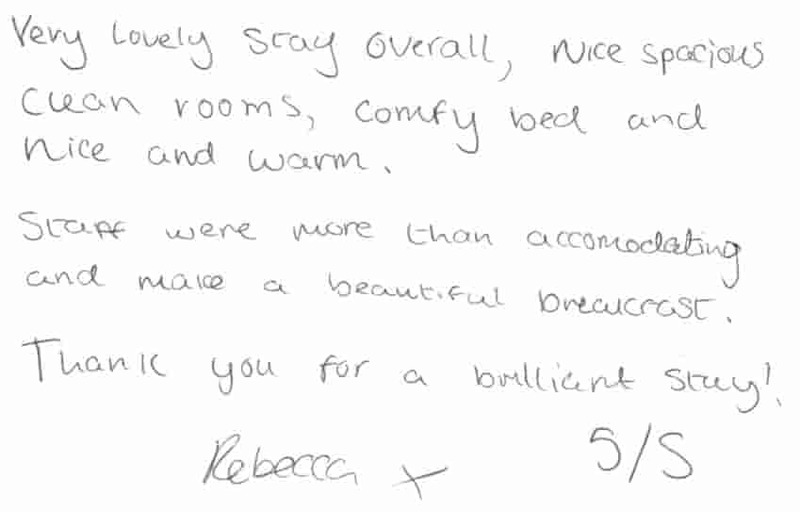 Our bed and breakfast accommodation welcomes 100's of guests each year who are performing or visiting The Customs House in South Shields. The Customs House, Mill Dam, South Shields, Tyne and Wear, NE33 1ES is an arts centre, theatre, cinema and gallery in South Shields. 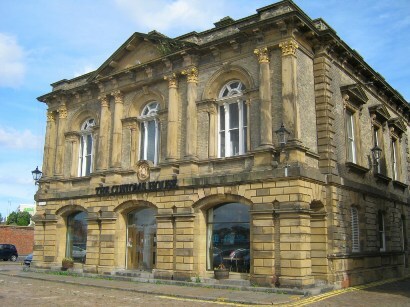 The Customs House is a Grade II listed building on the South bank of the River Tyne in the historic Mill Dam area of South Shields and welcomes over 250,000 visitors a year. It is approximately three minutes drive from our guest house accommodation in South Shields or 10-15 minutes walk depending on your pace. If you are driving to The Customs House there is all day every day free parking available. If you are visiting The Customs House in South Shields we hope this page has all the information you need for visiting the venue including map / directions, how to buy tickets / box office information, theatre seating plans, bar and public dining information, private dining information, gallery opening hours and the latest What's On brochure. 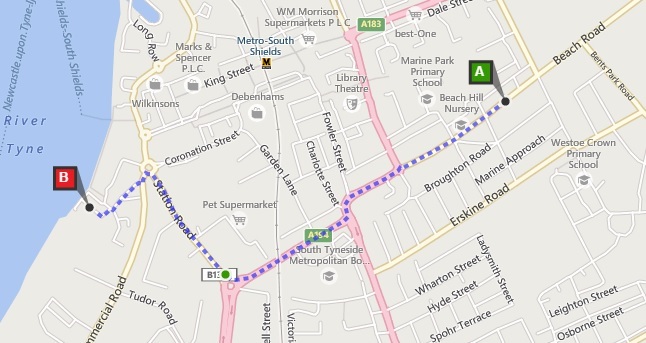 If you are staying at our bed and breakfast accommodation in South Shields then the walking / driving route to / from our guest house accommodation is shown below. Annie's Guest House is "A" and The Customs House, Mill Dam, South Shields, Tyne and Wear, NE33 1ES is "B". If you have yet to book your tickets The Customs House's box office is open Sunday to Tuesday 10am until 6pm; Wednesday to Saturday 10am until 8pm. On performance days the box office is open until 8pm. You can telephone The Customs House box office on 0191 454 1234. 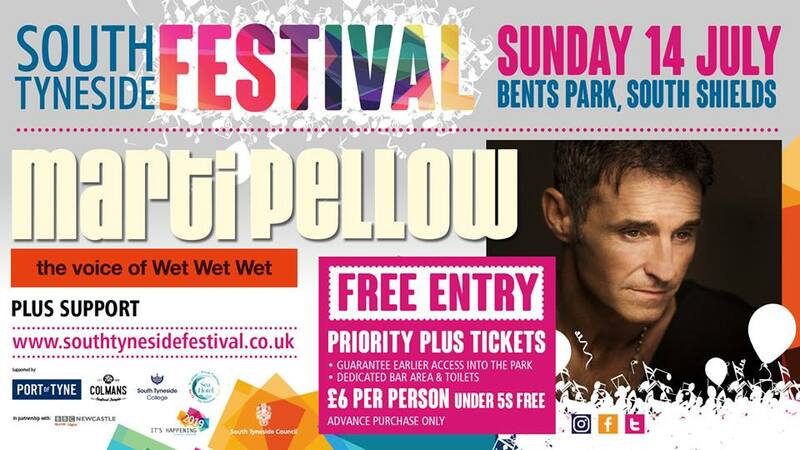 If the box office is closed there are authorised ticket sales available at Haven Point Leisure Centre, Whitburn Newsagency, Sunderland Tourist Information Centre, Gateshead Tourist Information Centre and Newcastle upon Tyne Tourist Information Centre. 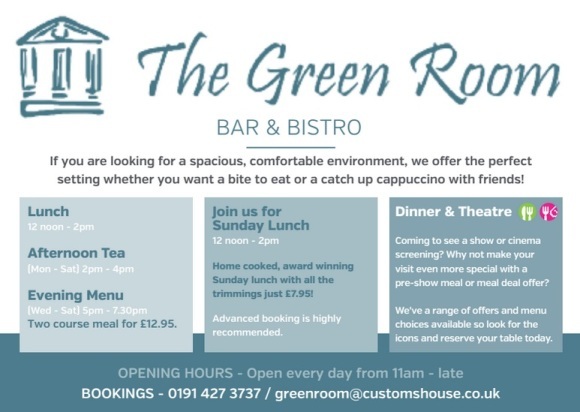 The Green Room is The Customs House's on site bar and bistro. It is open from 10am until 4pm with later closing on performance days. It's menu changes monthly and it serves hot and cold lunches Monday to Saturday 12 noon until 2pm; Sunday 12 noon until 3pm. Two courses cost £12.95; three courses £16.45. There is an early bird menu available Wednesday to Saturday 5pm until 8pm with last orders at 7.45pm. Sunday lunch is served from 12 noon until 2pm for £7.95 per person. You can see a 360º view of The Green Room here (opens in new window). For a sample menu please click here (opens in new window). The Customs House has two private dining options - Daltons for party nights and dining for up to 100 people and River View a private dining room and conference suite that unsurprisingly overlooks the river Tyne and caters for up to 24 guests. River View is open Monday to Saturday 12 noon until 2pm, Wednesday to Saturday 5pm until 8pm with two and three course meals available from £16.50. You can see a 360º view of River View here (opens in new window). The Gallery at The Customs House is open from 10am until 6pm on non-performance days, Sunday's and bank holidays. On performance days from 10am until 8.30pm.